Does Singapore have a climate change policy? Prime Minister Lee Hsien Loong arrives today at Copenhagen to attend the high-level negotiation at the UNFCCC COP15. Civil society participation at COP15 has been reduced to meagre 1,000 today. By friday, the number would be reduced to 90. Recently, a PhD candidate from Cape Town asked me about Singapore’s climate change policy. I was stumped by her question. Surely climate change has been factored into the deliberation process of policymaking, but it remains unclear whether environmental concern is the primary driving force in environmental policy making. Perhaps, the Merlion epitomises the climate change dilemma faced by Singapore’s policymakers. The Merlion is Singapore’s native mythical creature with a head of a lion and the body of a fish – not necessarily the best of both worlds. 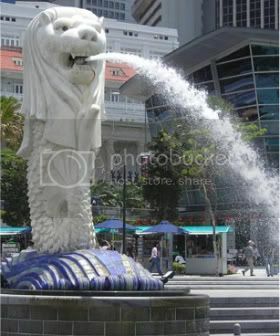 On land, the Merlion will die because it has no limbs. Under water, the Merlion will die because it cannot breathe. The Merlion is naturally incompatible with its environment, so it must adapt and create tools to ensure its survival. Our city-state enjoys some degree of prosperity, but precisely because of the prosperity, the economic value at risk to climate change is substantial. Climate change threatens Singapore with not only rising sea levels (which erodes our national boundary), but also the intensification of conflict and competition for resources worldwide. How this could be felt on Singapore’s economy would be via changes in international migration pattern, shipping routes and geographic profile of consumers. Countries like China are already making contingency plans. To improve its access to energy supply, the Chinese government is in the midst of building an oil pipeline across Myanmar into China. It is also constructing the Kra Canal, which has the potential of making the shipping route along the Straits of Malacca and Singapore obsolete. The impact of climate change on Singapore would thus not only come from Mother Nature but also how other state and non-state actors respond to climate change nationally, regionally and internationally. The nation-centric approach in many countries such as the USA and China involves a tight balancing act between climate change, economic growth and energy security. This makes sense for these countries as they have a huge domestic consumer market which essentially drives the global flow of goods and services. As an entrepot, Singapore’s ratio of trade to GDP is about 350%. What this translates into is that the private sector in Singapore has to not only adopt the best practices to remain relevant to its target markets, but it also has to monitor emergent practices from competing industry sectors in other countries to either preserve or elevate its position in the global value chain. Too much is at stake. Therefore, it is hardly surprising that the Singapore government has been promoting energy efficiency and other sustainable industry practices in Singapore to ensure that the domestic private sector remains relevant to international trade. For starters, liberalisation of the domestic electricity market has not only exposed domestic consumers to price fluctuation in the international energy market, but also spurred electricity producers to adopt more energy efficient practices such as the installation of stirling engines to generate electricity from waste heat. To ensure the building sector in Singapore remains at the forefront, the Government has introduced financial schemes to co-fund cost premium to achieve higher Green mark standards. Such policy would help the building sector to gain capability and capacity to build sustainable housing in Southeast Asia and also position the building sector to export its newfound expertise regionally and internationally. The Government has also been promoting environment-friendly practices that lead to reduced material and energy wastage in the electronics and chemical industry. These measures are instituted to ensure Singapore’s economic competitiveness. As an economic imperative, the government promotes Singapore aggressively as a test centre for green technology. In November 2009, David Tan, CEO of Energy Market Authority (EMA) revealed that the EMA has been working with Renault-Nissan, Mitsubishi and other auto manufacturers to secure a supply of electric vehicles (EV) for Singapore next year. EMA will also be rolling out a small network of EV charging stations, through a competitive tender to select an EV infrastructure service provider. On top of that, Pulau Ubin has been earmarked to be a test grid for renewable energy technologies. All these policies are aimed at developing Singapore’s clean technology expertise in order to complement the global demand profile for technology and engineering services which is shifting towards low-carbon options. The apparent conflation between Singapore’s climate change policies and industrial policies can only be resolved by recognising that there is no climate change policies, but only industrial policies as the government is guided by economic imperative. If indeed the government is guided by moral imperative, it should not remain silent on tackling the high carbon intensity of the marine bunkering industry in Singapore, which accounts for about 45% of Singapore’s CO2 emission. And also in view of the economic imperative to make Singapore industry relevant to the global market, it is more likely that the government will impose a carbon tax on producers rather than consumers, given the small size of domestic consumption and the tiny emission profile of local consumers in Singapore. The point of a carbon tax is to encourage carbon-efficient behaviour by discouraging specific acts and such a policy would only work if it were to target rational actors – something a consumer would hardly qualify as. Only industry actors have the incentive and resource to evaluate its every action and thus be more likely to respond as rational actors. Textbook economics does well in informing us that a producer tax will inevitably lead to a partial transfer to consumers through retail pricing, so there will be pressure on consumer behaviour too. Hence, Singapore has no climate change policy. Singapore only has an industrial policy to fine-tune its industrial development to remain relevant within global markets.